Romance has played a major role in the movies for decades and at the Aurora Theatre you can add a bit of Hollywood to your love life. The Aurora Theatre has been the setting to many “Will You Marry Me?” moments. We have had a “groom to be” rent the theatre and surprised his girlfriend with a film he made and before “The End” he asked her to marry him. We have had “Will You Marry Me?” on the marquee. We have even had a proposal on the big screen included in our screen ads before the feature film. However you want to ask the BIG question, The Aurora Theatre is the perfect place. Every bride wants to be the star on her special day and at The Aurora Theatre the two of you will be playing the most important roles of your lives, bride and groom. Wedding ceremonies at The Aurora are one of a kind because we work with you in creating the type of wedding you only see in the movies. We can assist you with a special presentation on the big screen as your guests arrive, play your favorite music before and after the ceremony and even popcorn for your guests to enjoy during the big show. 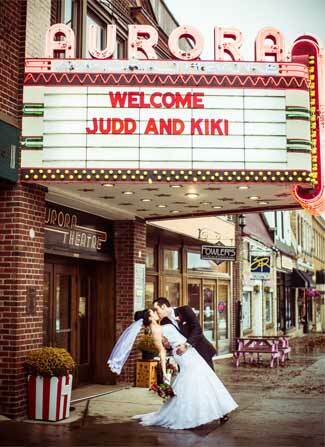 “Say I Do” to a historic theatre wedding. Commemorate a milestone anniversary at the Aurora. Share a private moment with the one you love and the rent the theatre to watch a special movie, say “I Love You” on the marquee or create a special message for the big screen before a feature film. It is also a great gift for a couple you may know celebrating their anniversary. For more information about renting The Aurora Theatre, please contact Lynn at 716.913.6834 or info@theauroratheatre.com.